Scott Walker is one of those artists who gets mentioned a lot at DRC – so much so that talking about him is almost forbidden now. Scott is also one of only a handful of artists who has created music which has scared me, so when Rob concocted his “frightening music” theme for All Hallow’s Eve, my choice was very simple. I considered Portishead’s ominous, 21st-century-paranoia-riddled 3, Nick Cave’s blood-drenched Murder Ballads, Godspeed’s doom-laden debut, Young God’s intense Only Heaven, and Suicide’s excruciating Frankie Teardrop, but none of them creep me out quite as much as the man who once sang Make It Easy On Yourself. I bought Scott’s legendary, infamous Tilt years ago, and listened to it first time out on headphones, alone, in a darkened room. The Cockfighter’s scratching, microcosmic opening lulled me into inter-cranial paranoia before unleashing industrial-percussion terror, the dynamic leap an act of extreme terrorism upon the listener that petrified and fascinated me in equal measure. I saw Tilt as the evil flipside of Talk Talk’s Spirit Of Eden… So eleven years later when The Drift was released, and initial reports described it as more inscrutable, more extreme, more intense, and more unsettling than even Tilt, I knew it was going to be a challenge. Five years on from its release, I’ve listened to The Drift only about three times; at 70 minutes, its intensity demands you find a big chunk of time as well as concentration and emotional fortitude. It is not an easy listen. Beyond the extremity of the performances and arrangements, The Drift is recorded entirely without compression, pop music’s secret weapon, which makes it sound even more surreal, avant-garde, and bizarre than it already is. Swarms of unidentified insects materialize from the speakers and envelop you; cacophonous avalanches of drums pummel you into submission; unidentifiable drones worm their way into our psyche; ominous guitar chords float in your peripheral vision; and moments of complete calm and quiet draw your attention close, bisecting the terror, and making the eruptions all the more terrifying. Scott himself sings impenetrably of psoriasis, stillborn twins, ancient cultures, and who knows what else, his barren, reaching voice instilled with drama and sorrow and hopelessness. He punches a side of pork, lets loose a blood-curdling Daffy Duck impersonation, and sits at the centre of this entire theatre of bleakness. The Drift is fascinating and harrowing in equal measure. Tom Listened: Well, what can you say! A remarkable, literally extraordinary listen. I always find it odd when critics laud the likes of Dylan, Young, Springsteen for remaining ‘vital’ after all these years. They’re not ‘vital’! They’re hanging in there. Scott Walker is ‘vital’. Scott Walker is making records (admittedly at a snail’s pace) that not only sound unlike anything he’s made before, they’re unlike anything that has ever been released in recorded music. You know as you listen that he couldn’t care less if anyone is paying attention to his output. Maybe he’s happy that they are, but it wouldn’t bother him if they weren’t. The Drift is the sound of emancipation from the pressures of expectation, the sound of a driven individual supremely confident that he can replicate his vision in recorded form, the sound of genius. Having said that, I probably won’t be buying The Drift. I have (and love) Tilt, I have (and am getting to know, after owning it for 10 years) Climate of Hunter and I am not sure I need another of Scott Walker’s ‘recent’ releases, especially one that will probably (although not in the same way as Sunn O)))) give me nightmares! Great to hear it though…next time can we leave the lights on? 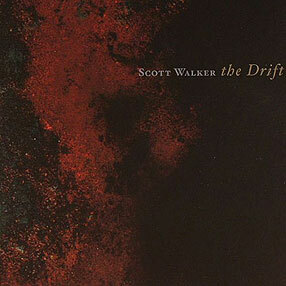 Rob listened: I own the Drift and admire it hugely. It’s an incredible achievement which, as Tom and Nick have outlined, but most other artists’ piddling efforts into some considerable shade. I don’t have much to add other than that I first listened to it alone in a car hurtling up the M5 in the dark and at ear-pummelling volume. I was lucky to stay on the road and to this day during my quiet moments, somewhere in the distance I can still hear Scott Walker intoning, “bam… bam…bam…bam…”.